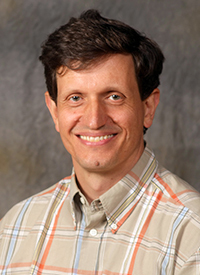 Dr. Heyl works on the evolution and function of signaling pathways. In particular he is interested in the origin and in the molecular mechanisms of the signal transduction pathway of a class of plant hormones called cytokinins. Wet lab experiments and bioinformatics analysis tools are used towards these goals. Kaltenegger, E., Leng, S., Heyl, A. (2018), The effects of repeated whole genome duplication events on the evolution of cytokinin signaling pathway. BMC Evolutionary Biology 18(1):76. Reyes-Olalde, J.I., Zúñiga-Mayo, V.M., Serwatowska, J., Chavez Montes, R.A., Lozano-Sotomayor, P., Herrera-Ubaldo, H., Gonzalez-Aguilera, K.L., Ballester, P., Ripoll, J.J., Ezquer, I.,Paolo, D., Heyl, A., Colombo, L., Yanofsky, M.F., Ferrandiz, C., Marsch-Martínez, N., de Folter, S. (2017), The bHLH transcription factor SPATULA enables cytokinin signaling, and both activate auxin biosynthesis and transport genes at the medial domain of the gynoecium. PLoS Genetics 13(4):e1006726. identification of transcriptional regulators. Physiologica Plantarum. 160(1):2-10.
von Schwartzenberg, K., Lindner, A.C., Gruhn, N., Šimura, J., Novák, O., Strnad, M., Gonneau, M., Nogué, F., Heyl, A. (2016), CHASE domain-containing receptors play an essential role in the cytokinin response of the moss Physcomitrella patens. Journal of Experimental Botanty, 67, 667-679. Gruhn, N., Seidl, M. S., Halawa, M., Heyl, A. (2015), Members of a recently discovered subfamily of cytokinin receptors display differences and similarities to their classical counterparts. Plant Signaling and Behaviour, 10, e984512. Frébortová J, Greplová M, Seidl MF, Heyl A, Frébort I. (2015), Biochemical Characterization of Putative Adenylate Dimethylallyltransferase and Cytokinin Dehydrogenase from Nostoc sp. PCC 7120. PLoS One, 10, e0138468. Gruhn, N., Halawa, M., Seidl, M.S., Snel, B., Heyl, A. (2014), A new subfamily of cy-tokinin receptors is revealed by an analysis of the evolution of the two-component signaling system of plants. Plant Physiology, 165, 227-237. Heyl, A., Brault, M., Frugier, F., Kuderová, A., Lindner, A.C., Motyka, V., Rashotte, A.M., von Schwartzenberg, K., Vankova, R., Schaller, G.E. (2013), Nomenclature for members of the two-component signaling pathway of plants. Plant Physiology, 161, 1063-1065. Ramireddy, E., Brenner, W.G., Pfeifer, A., Heyl, A., Schmülling, T. (2013), In planta analysis of a cis-regulatory cytokinin response motif in Arabidopsis and identification of a novel enhancer sequence. Plant & Cell Physiology, 54, 1079-1092. Gruhn, N. and Heyl, A. (2013), Updates on the model and the evolution of cytokinin signaling. Current Opinion Plant Biology, 16, 569-574. Cutcliffe, W., Hellmann, E., Heyl, A., Rashotte, A. (2012), CRFs form protein-protein interactions among each other and with members of the cytokinin-signalling pathway in Arabidopsis via the CRF domains. Journal of Experimental Botany, 62, 4995-5002. Wulfetange, K., Lomin, L., Romanov, G.A., Stolz, A., Heyl, A., Schmülling,T. (2012), The cytokinin receptors of Arabidopsis thaliana are located mainly to the endoplasmic reticulum. Plant Physiology, 156, 1808-1818. Brenner, W.G., Ramireddy, E., Heyl, A., Schmülling, T. (2012), Gene regulation by cytokinin in Arabidopsis. Frontiers in Plant Science, 3, 8. Heyl, A., Riefler, M., Romanov, G.A., Schmülling, T. (2012), Properties, functions and evolution of cytokinin receptors. European Journal of Cell Biology, 91, 246-256. Wulfetange, K., Saenger, W., Schmülling, T., Heyl, A. (2011), E. coli-based cell-free expression, purification and characterization of the membrane-bound ligand-binding CHASE-TM domain of the cytokinin receptor CRE1/AHK4 of Arabidopsis thaliana. Molecular Biotechnology, 47, 211-219. Banks, J.A., Nishiyama, T., Hasebe, M., Bowman, J.L., Gribskov, M., …… Heyl, A., ……, Lindquist, E., Lucas, S., Rokhsar, D., Grigoriev, I.V. (2011), The Selaginella genome identifies genetic changes associated with the evolution of vascular plants. Science, 332, 960-963. Hellmann, E., Gruhn, N., Heyl, A. (2010), The more, the merrier - Cytokinin signaling beyond Arabidopsis. Plant Signaling and Behaviour, 5, 1365-1371. Pils, B. and Heyl, A. (2009), Evolution of the cytokinin signaling pathway. Plant Physiology, 151, 782-791. Rensing, S.A., Lang, D., Zimmer, A.D., Terry, A., Salamov, A., …….Heyl, A., ……..S., Mishler, B.D., Reski, R., Grigoriev, I.V., Quatrano, R.S., Boore, J.L. (2008), The Physcomitrella genome reveals evolutionary insights into the con-quest of land by plants. Science, 319, 64-69. Romanov, G., Lomin, S., Rakova, N., Heyl, A., Schmülling, T. (2008), Does NO play a role in Cytokinin signal transduction? FEBS Letters, 582, 874-880. Heyl, A., Ramireddy, E., Brenner, W., Riefler, M., Allemeersch, J., Schmülling, T. (2008), Ectopic expression of the dominant transcriptional silencer gene ARR1-SRDX in Arabidopsis suppresses pleiotropic cytokinin activities. Plant Physiology, 147, 1380-1395. Dortay, H., Gruhn, N., Pfeifer, A., Schwerdtner, M., Schmülling, T., Heyl, A. (2008), Towards an interaction map of the two-component signaling pathway of Arabidopsis thaliana. Journal of Proteome Research, 7, 3649-3660. Heyl, A., Wulfetange, K., Pils, B., Nielsen, N., Romanov, G., Schmülling, T (2007), Evolutionary proteomics identifies ligand-binding amino acids of the cytokinin receptor CHASE domain. BMC Evolutionary Biology, 7, 62-70. Dortay, H., Mehnert, N., Bürkle, L., Schmülling, T., Heyl, A. (2006), Analysis of protein interactions within the cytokinin-signaling pathway of Arabidopsis thaliana. FEBS Journal, 273, 4631-4644. Bürkle, L., Meyer, S., Dortay, H., Lehrach, H., Heyl, A. (2005), In vitro recombination cloning of entire cDNA libraries in Arabidopsis thaliana and its application to the yeast two-hybrid system. Function and Integrative Genomics, 5, 175-183. Heyl, A. and Schmülling, T. (2003), Cytokinin signal perception and transduction. Current Opinion in Plant Biology, 6, 480-488. Heyl, A., Muth, J., Santandrea, G., O'Connell, T., Serna, A., Thompson, R.D. (2001), A transcript encoding a nucleic acid-binding protein specifically ex-pressed in maize seeds. Molecular Genetics and Genomics, 266, 180-189. Heyl, A., (2018). Members of the core cytokinin signaling pathway display diverging evolutionary patterns, Plant Biology 2018 conference, Montreal, Canada. Heyl, A., (2018). Towards understanding the origin and the evolution of cytokinin signaling. ASPB Northeastern Section Conference, Amherst, MA. Heyl, A. (2014). Evolutionary analysis and functional characterization of cytokinin receptors across the plant kingdom. In Molecular Biology of Plants Meeting. Dabringhausen, Germany. Heyl, A. (2013). A new subfamily of cytokinin receptors is revealed by an analysis of the evolution of the two-component signaling system in plants. In German Botanical Society. Tübingen, Germany. Brandt J. and Heyl, A. (2013). AgED: Extraction and Evaluation of Elliptic Fourier Descriptors from Image Data in Phenotype Assessment Applications. In International Conference on Bioinformatics Models, Methods and Algorithms, (pp. 324-327). Barcelona, Spain. Heyl, A. (2011). Analysis of the evolution of the cytokinin regulatory system in Physcomitrella patens and beyond. In Moss Meeting. Herzogenhorn, Germany. Heyl, A. (2011). Origin and evolution of the cytokinin regulatory system. In German Botanical Society. Tübingen, Germany. Heyl, A. (2011). Unraveling the evolution of the cytokinin signaling. In Molecular Biology of Plants Meeting. Dabringhausen, Germany. Twardziok, S., Siebert, H., Heyl, A. (2010). Stochasticity in reactions: a proba-bilistic Boolean modeling approach. In International Conference on Computational Methods in Systems Biology. Trento, Italy. Heyl, A. (2010). Evolution of the cytokinin signal transduction pathway. In IPGSA. Tarragona, Spain. Heyl, A. (2010). Structural and functional characterization of plant cytokinin receptors. In From Protein Structure to Membrane Dynamics Meeting. Berlin, Germany. Heyl, A. (2009). Unraveling the evolution of the cytokinin signal transduction pathway. In German Botanical Society Meeting. Leipzig, Germany. Heyl, A. (2008). Evolutionary and functional aspects of the cytokinin signal transduction pathway. In Trinational Arabidopsis Meeting. Zurich, Switzerland. Heyl, A. (2008). Analysis of the function of B-type ARRs in the cytokinin signal transduction using a dominant repressor. In Arabidopsis Meeting. Montreal, Canada. Heyl, A. (2016, July). The evolution of the perception of the phytohormone cytokinin. Society of Experimental Biology (SEB) Conference, Brighton, UK. Heyl, A. (2015, January). New insights into the evolution of a signaling system – the cytokinin story. Unversity of Kiel, Kiel, Germany. Heyl, A. (2014, August). Characterization of a novel repressor of the transcriptional response to cytokinin. ACPD Meeting, Prague, Czech Republic. Heyl, A. (2014, June). Molecular evolution of the cytokinin signaling system. University of Jena, Jena, Germany. Heyl, A. (2013, August). Evolutionary insights into the two-component signaling system in plants reveal a new clade of putative cytokinin receptors. IPGSA, Shanghai, China. Heyl, A. (2012, August). Evolution of a signal transduction pathway - the cytokinin story. University of Potsdam, Potsdam, Germany. Heyl, A. (2012, July). Phylogenetic analysis reveals new subfamily of cytokinin receptors. Freie Universitaet Berlin, Berlin, Germany. Heyl, A. (2012, February). Evolution of signaling systems. University of Münster, Münster, Germany. Heyl, A. (2011, September). Origin and evolution of the cytokinin regulatory system. Palacký University, Olomouc, Czech Republic. Heyl, A. (2009, June). Identification of protein interactions within the cytokinin signal transduction pathway and beyond. ENSA Meeting, Brno, Czech Republic. Heyl, A. (2009, June). Evolutionary and functional aspects of the cytokinin signal transduction pathway. University of Düsseldorf, Düsseldorf, Germany. Heyl, A. (2009, March). Function and evolution of the cytokinin signal transduction pathway. University of Göttingen, Göttingen, Germany. Riefler, M., Werner, T., Heyl, A. (2007). Cytokinin. In Roberts, K. (Eds.). Handbook of Plant Science. (pp. 369-376). United Kingdom: John Wiley and Sons, Ltd.
Heyl, A., Werner, T., Schmülling, T. (2006). Cytokinin metabolism and signal transduction. In Hedden, P., Thomas, S. (Eds.). Plant hormone signaling. (pp. 93-123). United Kingdom: Blackwell Publishing Ltd..